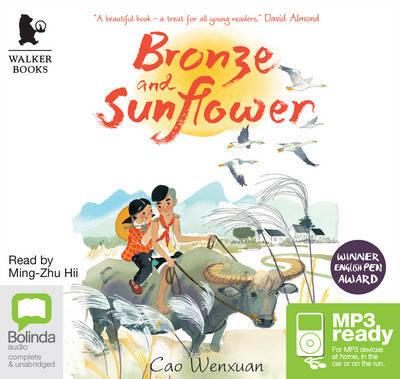 A beautifully written, timeless tale by bestselling Chinese author Cao Wenxuan. When Sunflower, a young city girl, moves to the countryside, she grows to love the reed marsh lands - the endlessly flowing river, the friendly buffalo with their strong backs and shiny round heads, t... read full description below. A beautifully written, timeless tale by bestselling Chinese author Cao Wenxuan. When Sunflower, a young city girl, moves to the countryside, she grows to love the reed marsh lands - the endlessly flowing river, the friendly buffalo with their strong backs and shiny round heads, the sky that stretches on and on in its vastness. However, the days are long, and the little girl is lonely. Then she meets Bronze, who, unable to speak, is ostracised by the other village boys. Soon the pair are inseparable, and when Bronze's family agree to take Sunflower in, it seems that fate has brought him the sister he has always longed for. But life in Damaidi is hard, and Bronze's family can barely afford to feed themselves. Will the city girl be able to stay in this place where she has finally found happiness? Cao Wenxuan is one of China's most important children's writers and is widely considered the country's most subtle and philosophical, often referred to as China's very own Hans Christian Andersen. He is a professor of Chinese literature at Peking University, and has in turn taught some of China's best young writers. Many of his books have been bestsellers, including Thatched Cottage and Red Gourd, and his work has been translated into French, Russian, Japanese, Korean and English. Cao has won several of China's most prestigious awards for children's literature, including the Song Qingling and Bing Xin prizes. Ming-Zhu Hii has been a professional voiceover artist and performer for over 12 years and has worked extensively with many major and boutique brands, across all forms of media. Ming-Zhu is known for appearing in The Heartbreak tour and Party Tricks and is also the co-director of The Public Studio, an experimental and narrative production company who work across film, video and live performance. Helen Wang is a London-based translator who translates fiction, essays and children's books from Chinese to English.